The turnbuckle brace is now industry standard, and available from at least half-a-dozen different companies. These braces have revolutionized the industry, allowing contractors to deliver walls that are straight, level, plumb, and square every single time. 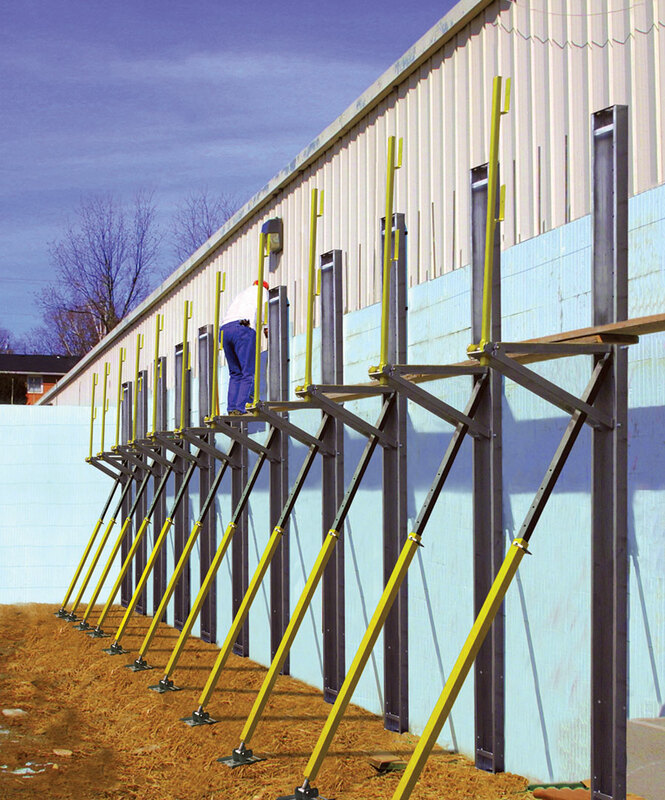 Every ICF manufacturer now recommends adjustable metal bracing as the only approved bracing method, and mastering the basics of this tool is essential for any ICF installer. 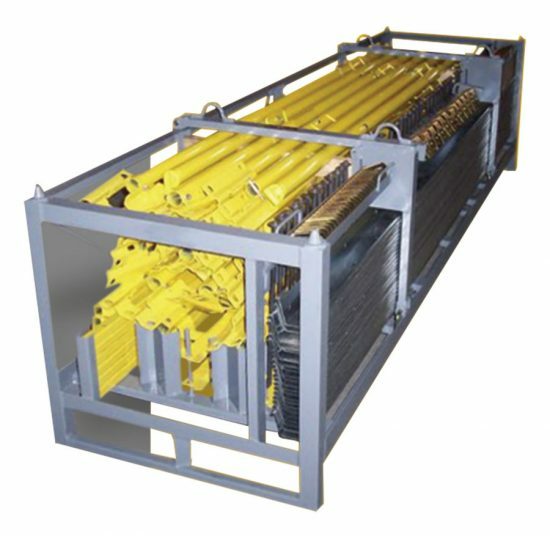 Turnbuckle bracing consists of several components. 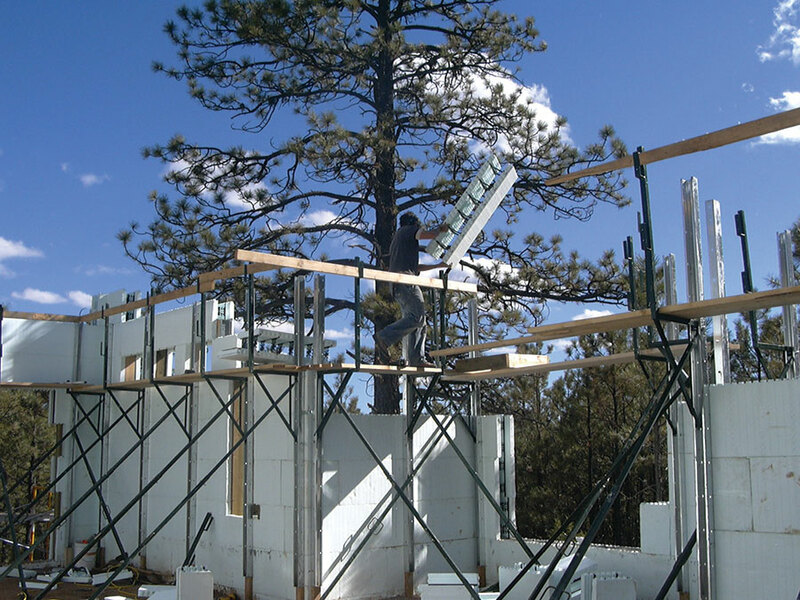 A steel or aluminum “strongback” is attached to the ICF wall, usually after the first three courses are stacked, to keep the forms straight. These are available in various lengths, typically 8, 10, and 12 feet. Near the top, a platform bracket for scaffold planking juts out from the strongback. Sometimes this bracket is attached as a separate piece. The platform often includes a slot for a safety handrail to slide into place. the threaded shaft, the wall can be adjusted for plumb, even after being filled with concrete. 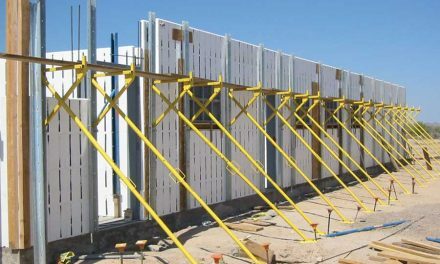 Spacing between braces is determined by a number of factors, primarily wind loads on the wall, concrete pressures during the pour, and the length of scaffolding planks. This nearly always works out to be no more than 5 to 6 feet apart, regardless of the brand of ICF used. Additional braces are needed near window and door openings, on corners, and T-intersections. A good rule of thumb is that 32 units will be sufficient for a 1,500 sq. ft. basement. 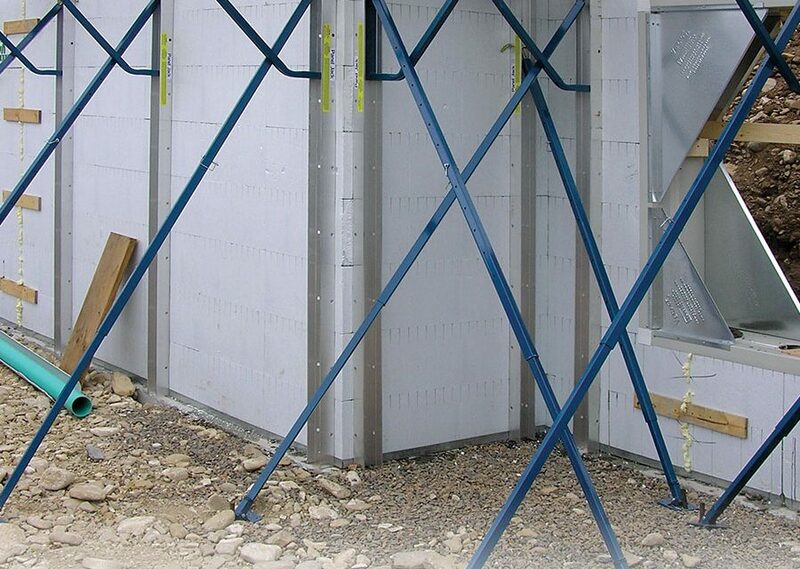 If the design has large windows or lots of corners, set up additional bracing before the pour. In addition to turnbuckle bracing, the wall will also need other support. 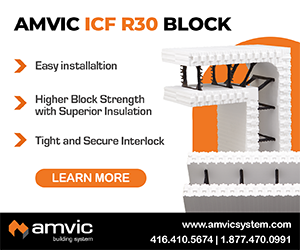 The amount varies widely from one brand of ICF to another, with some requiring virtually nothing beyond the standard bracing. Others need glue at every course, strapping tape, internal wire clips, several sheets of plywood, and dozens of board feet of “one-by” to support weak areas. Check with your local distributor—or ask to visit one of his jobs on pour day—to find out how much additional support is needed. 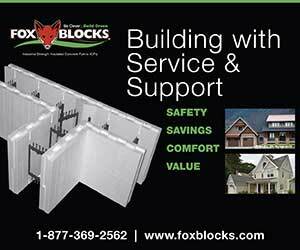 John Hatfield, a regional sales manager for Quad-Lock Building Systems, says, “The number one rule with scaffolding is [become] very familiar with the installation manual for your system; know it inside and out, including all the specifications for fastener sizes and spacing, load ratings, etc. Be sure you have all the required pieces gathered at hand before you start to construct your scaffold. This way you won’t be tempted to substitute or leave out critical components in the rush of assembly. The strongbacks have a number of slots spaced vertically along their length. 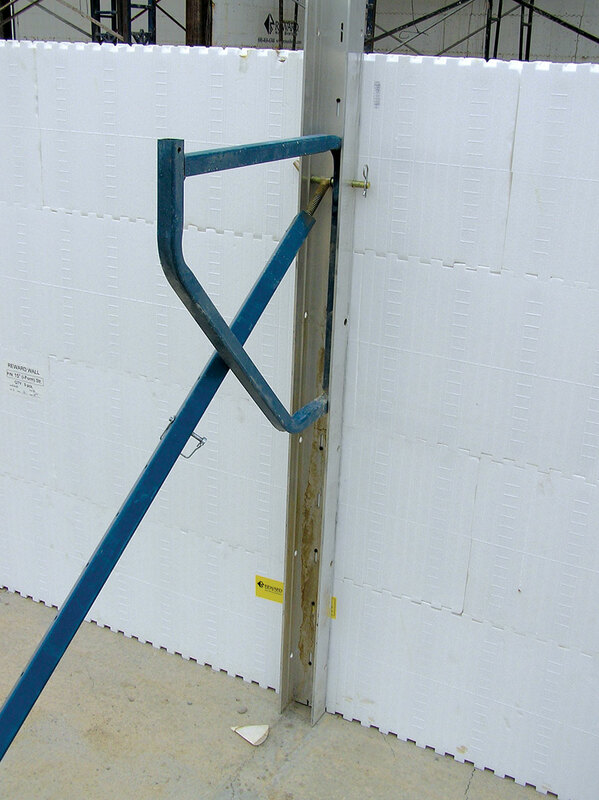 Place the strongback against the wall, and using a #10 or #12 screw, fasten the strongback to the block using the ICFs’ furring strip. On most jobs, the braces are set on the interior of the wall. For many basements, it’s the only option. On other jobs, it’s a matter of convenience, as the interior floor is flat and smooth. Check the wall for plumb, then fasten the bottom of the turnbuckle shaft to the ground. On nine jobs out of ten, a form stake is hammered through the footplate to secure it. If a wooden subfloor is already in place, fasten the footplate securely to that. Option 1: If feasible, brace from the outside of the structure. Option 2: Fasten short lengths of 2x6 to the floor using a quality construction adhesive. Wait for the glue to cure, then screw each footplate to the corresponding length of 2x6. Option 3: Fasten a length of 2x6 to the bottom of the strongback, then fasten the footplate onto the other end of the 2x6. Option 4: One innovative contractor set a pallet full of water barrels on the floor, filled the barrels, and then fastened the footplate to the pallet. Other methods may exist that the author is not aware of. 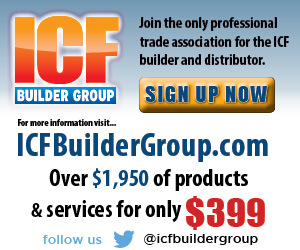 Check with your local distributor or the technical director at your preferred ICF company for specific guidance. Before the pour, set a string line between the top of the corner strongbacks. Adjust the remaining braces to just touch the string. 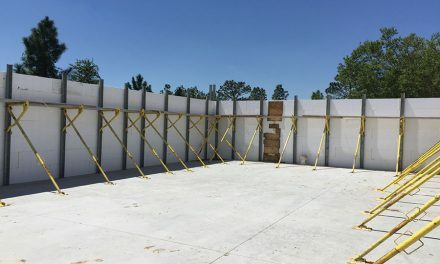 Some contractors have found that ICF walls tend to move outward when filled with concrete, and deliberately set the wall ¼ inch inside-of-plumb before the pour. As soon as the concrete is in the wall—while it’s still wet—double check that the top of the strongback are still barely touching the string. Platform brackets and turnbuckles attach to the strongbacks with specified pins. 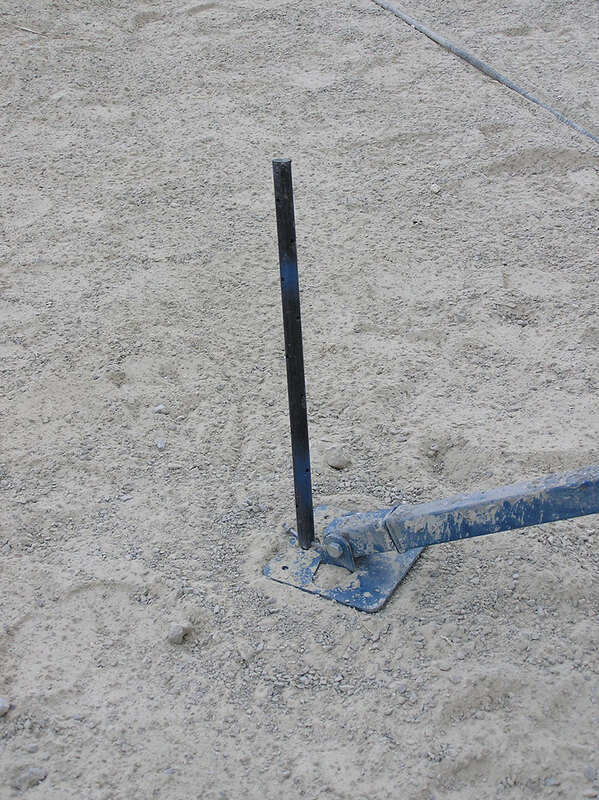 Substituting another bolt, a short piece of rebar, or perhaps a spike is not sufficient and creates both a safety risk and a sure-bet safety violation when the OSHA inspector shows up. 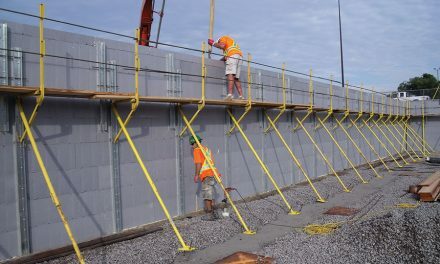 The walk platform must be 18 inches wide, rated to support workers and equipment, and must include a toe board if the walk surface is more than 8 feet above grade. Handrail must be able to support a load of 250 pounds placed perpendicular to it, and meet specific height requirements. Strongback Material and Strength: Steel is strongest, but heavy. Galvanized or power coating is essential to prevent rust. Aluminum is more common, but some manufacturers use thinner material to reduce costs, so be sure the strongback is rated for the loads it will be subjected to. Turnbuckle Style and Shape: Some brands, like Giraffe and Arxx, use tubular steel. 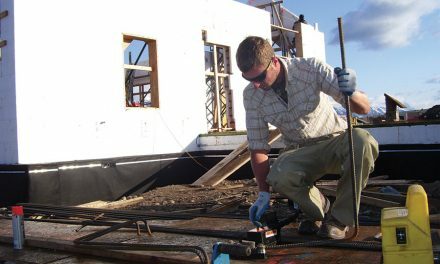 Others use a turnbuckle with a square cross section. At least one manufacturer offers a system that uses “provide-your-own” 2x4 lumber, with a small turnbuckle at the lower end. Other differences include whether the turnbuckle can be adjusted from up on the wall (useful for small crews), and whether the threads on the rod are protected from concrete splatter. Storage: Unless you’re a busy distributor, bracing will spend more time in storage than on the job. Mono-Brace has a patented “foldaway” design that keeps everything—pins, handrail, platform bracket, turnbuckle, etc.—tucked neatly inside the strongback. Others have detachable platform brackets so the units store more compactly. Giraffe, Amazing Brace, Plumwall, and a few others have trailer storage units that keep everything neat and organized on the jobsite. The trailer units are great for businesses that rent bracing to smaller contractors and do-it-yourselfers who can’t justify buying their own.